Active recovery focused on shoulder mobility today. Need to find some proper wrist stretches. Left wrist has felt like it's needed to "pop" since I started this. Probably a minor injury I hadn't noticed or some severe tension since I haven't been lifting for a while. GMB again a great source for wrist mob. they have a free video on youtube i think. when i was into calisthenics last year their little routine made a huge difference for me. Searched for that. Will probably just start doing a little bit of that every morning. Workout so far have all been the last 20 minutes or so before bed. Not necessariy ideal or even the "best" if you ask anyone trying to gain muscle or work towards performance but it's working out right now and I'm even sleeping better so I don't mind. Save for a short stretch at like 3am last night where I was wide awake for a bit, I've been going to sleep a few minutes earlier every night. Hopefully that keeps up and I can actually fall asleep before midnight on a given day. Accidentally redid day 2 of the GMB free package thing today. Doesn't really matter since I'm just trying to stay active though. The core work/"hollow body" movements remind me a lot of the sort of stuff I did in track back in the day so that was pretty fun actually. Left shoulder is surprisingly sore after the shoulder mobility stretches. Not really hurting but I can definitely feel it when I'm laying on my left side in bed. We'll see how that keeps up over time. Finished up last week pretty well then had performances Friday and Sunday so no updates. Not as sore as when I've tried to just jump straight back into lifting (which usually leaves me barely walking for a week), but I'm still feeling good about the results. Will probably just redo the exercises for this week while I look for a similar program that isn't super boring generic bodyweight stuff. Not much of a budget to go out and buy programs I don't "need" when I haven't had a roommate for a couple months until just recently. Left shoulder in particular has been noticeably sore. Not in a bad way, I think the exercises and off-day stretching has been helping it and helping stabilitiy. Definitely a bit of soreness each day though. More of the same mobility exercises. Feeling pretty good about them but after a few concerts and way too much time on a bus with students for a playoff game last friday my hips have felt super tight, especially my right side, so this weekend and today for my off days I've focused on some of these exercises to start loosening things up. Another week of standing in one place entirely too long and traveling on a bus. Football team is out though, so finally the season is over for my students playing in the band. More hip flexibility stuff over the weekend. Repeat 4 times. Will decrease rest as I feel better down to one minute. Need to get a pullup bar. that reminds me. I think I want to get a 45 degree back extension again. Carried some seriously heavy boxes of new stuff today for one of my classes. Kids were excited for new stuff, but I must have not noticed how badly the corners were stabbing into my biceps. 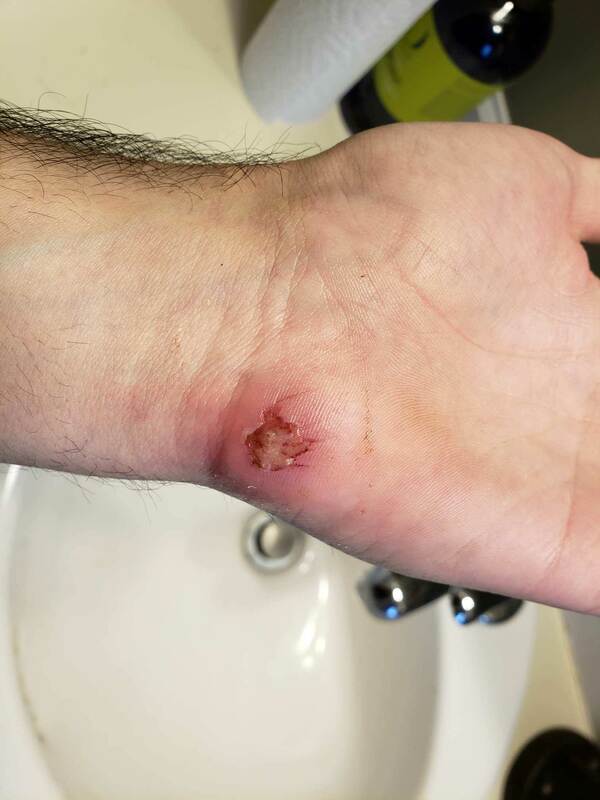 Have a small spot on the center of my left, and a bigger one ont he bottom of my right bicep that are in a bit of pain and looks sort of spotted from the damage. Shouldn't be too bad hopefully. Just doing shoulder stretches today. Same routine as last post for M-W-F this past week. Super sore today from helping a friend with rusty over used brakes on a car. Was grinding metal to metal. Took like 6 hours to replace the rears. Don't have many power tools to help so my forearms and back are super sore from so much clamping on vise grips and pulling on stuff. 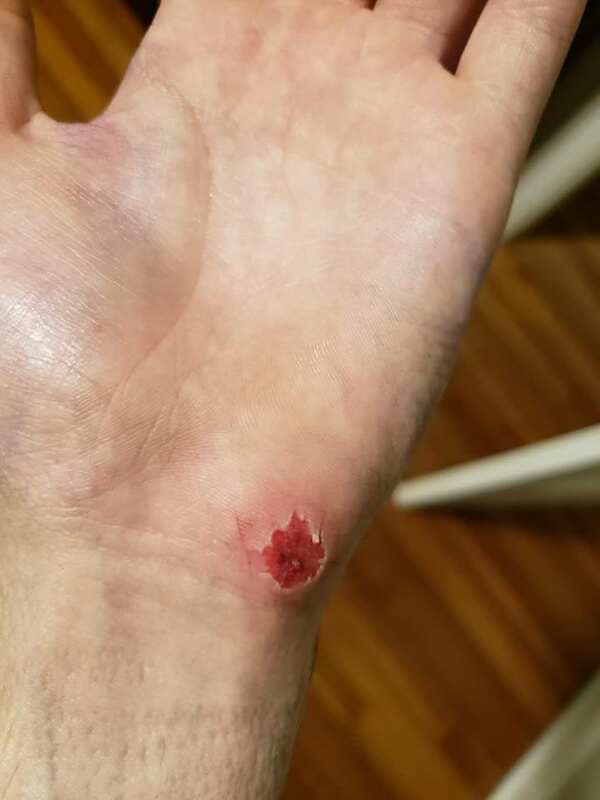 Anyway, 2 nights ago I slipped in front of my house and hurt my palm pretty bad. Scrape wasn't too big but it was super deep, will upload pic later. Can't put even light weight on it, so I'll probably be doing strictly core/leg stuff this week. ya that stuff can get u strong af. hah. i used to work on my grip strength hard, and this electrician next door could destroy me on anything grip related because he uses his hands every day for work. could close the #2 CoC gripper, first try. Definitely know what that's like. My dad has worked manual labor since he was 13 or 14. He's been the provider pretty much his whole life since his dad died young. Anyway, he's slightly shorter and a bit weaker than me pound for pound... until you compare anything related to hand strength. There was a time in his old job when his shoulder and elbows were so messed up he couldn't even do a pushup. But try to clamp a vise grip and he could basically destroy anything with it. His wrists and fingers are visibly thicker than mine, and not by a small margin either despite being generally as thin or thinner. Yeah... we'll see how long this thing takes to heal. Mostly trying trying not to let it get infected right now. interesting about your dad. my dad is similar (probably alot less grip strength in comparison). he is a piano player, whose done lots of "yard work" his whole life (and martial arts/tennis). believe it or not his hands are very strong. his fingers are so much thicker than mine, it's crazy. hah. I think he closed my #1 gripper, first try. I couldn't even close the trainer without tons of work. damn @ those photos. that looks painful eek!!! put that neosporin on it non-stop heh! Basically been putting different stuff on it and changing bandaids every 12 hours. Looking much better. Some of the lighter stuff in the second pic is actually some neosporin like stuff left after taking off bandaging. The red spot in the first pic is after healing a bit. was darker before, and that's where all the bleeding was coming from. No debris in it fortunately, but it felt like a thin puncture.